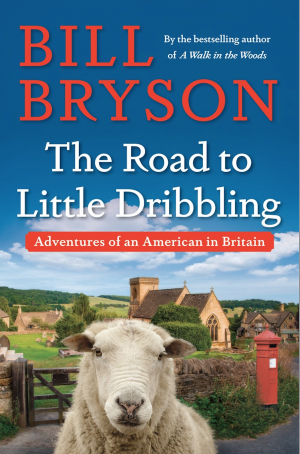 A friend asked if would recommend reading Bill Bryson’s new book The Road to Little Dribbling: Adventures of an American in Britain. Actually I’m just at the beginning of reading it so I answered the question from a different perspective. What is the book about? Getting old, travel in England and the devastating indirect effects of climate change and sea level rise. I personally consider reading to be one of the last remaining luxuries we have to enjoy in a world of crowding pressures. I consider Bryson to be among the most brilliant, wittiest and funniest social commentators alive today. So yes, on both counts I would recommend reading it. Some people, like my son, find Bryon’s attention to mundane detail of the world to be tedious and even depressing. I think that is a risk taken by any intellectual person today. The process of looking at the world and interpreting why they are, especially in relation to what they used to be, can be quite a depressing exercise. Bryson is generally characterized as travel writer and this is his second book about travel in England. His first book about travel in England was Notes from a Small Island published in 1995. That first book was voted the nation’s favorite book on the topic of modern Britain in a BBC poll and sold over two million copies. The sad truth of the entire field of travel writing is that it can be summarized as “It isn’t as impressive as it used to be”. It should be quite a sobering human experience for a travel writer and his audience to notice that no matter where you go, no matter what topic you cover, you can report that your overall observation that the physical world and the state of humanity is in a state of decline. I see the same basic report coming from virtually all science writers and travel writers today. The next logical question should be “If it’s so depressing then why is it funny?” That topic, I think, is better covered by other writers like Bill McKibben in books like Eaarth: Making a Life of a Tough New Planet. If you are interested in generally learning more about the world but unfamiliar with Bill Bryson’s work, I would suggest starting with A Short History of Nearly Everything and A Walk in the Woods: Rediscovering America on the Appalachian Trail. As a writer, I’ve valued Bryson’s Dictionary for Writers and Editors and Bryson’s Dictionary of Troublesome Words. Even though the titles do not indicate so, they are just as funny.